Life is Marketing: Brutal Honesty, the new marketing advantage? Two companies have used marketing tactics recently that whipped my head around (figuratively, fortunately). Both were brutally honest. It was amazing, funny and rereshing. Remember that 1990 movie with Dustin Hoffman and Darryl Hannah called Crazy People? He was an ad exec that went crazy and started writing lines like, "Metamucil. It helps you go to the toilet. If you don't use it, you get cancer and die." and "United, most of our passengers get there alive." These two companies suggest he might have been on to something. No. We are busy sourcing new products and shipping orders. You can post a comment to our community board, but we don't guarantee we'll respond. You should Google for the manufacturer contact to get product answers – we suggest a dating service, magic 8 ball, or ouija board for general life solutions. Will I receive customer support like I'm used to? No. Well, not really. If you buy something you don't end up liking or you have what marketing people call "buyer's remorse," sell it on eBay. It's likely you'll make money doing this and save everyone a hassle. If the item doesn't work, find out what you're doing wrong. Yes, we know you think the item is bad, but it's probably your fault. Google your problem, or come back to that product discussion in our community and ask other people if they know. Maybe I'll just wait until this item becomes more widely available, so I know what other users think of it. If that's how you want to live your life, sure. Fine. There are those who would say that your type will inherit the earth. Until then, though, the rest of us will have all the coolest gizmos. Boom. Loved the company instantly. I now check it daily and yes, I wooted and bought something... Cool. 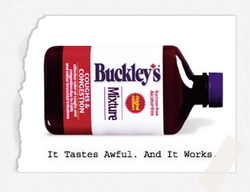 The other is Buckley's Cough Medicine. Their ads compare the taste of their product to the liquid that collects at the bottom of a garbage can. Apparently, they've been doing this shtick in Canada for years, but now they're rolling out down here. Reminds me of Listerine's brilliant campaign to battle Scope by acknowledging that it tasted bad, but it worked. What do you think, is brutal honesty a trend? Probably not, but it's giving these two companies an edge.